Hope Arellano and Benjamin Avendaño. Benjamin Avendaño from GJ Racing putting on the pressure. The fifth chukker opened with an Invicta goal by Tony Calle, who moved to Wellington from Quito, Ecuador, three years ago. 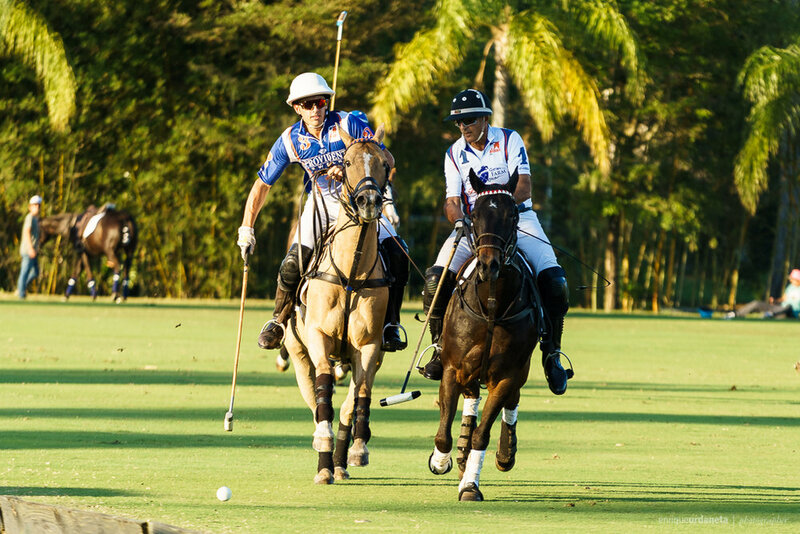 In the sixth chukker Gobin passed the ball on two long shots to Arellano, who tied the game at 2. Gonzalez swooped past Brooke USA ambassador Benjamin Avendaño to score, ending round three 3-2 for Invicta over GJ Racing. The Invicta team and the GJ Racing team sprint to the goal. It was a beautiful evening for Brooke USA's Sunset Polo™ & White Party.